The Dodd Frank Act Section 1502, part of the U.S. government’s Dodd-Frank Wall Street Reform and Consumer Protection Act, signed into law in July 2010, requires publicly traded companies to ensure that the raw materials they use to make their products are not tied to the conflict in Congo, by tracing and auditing their mineral supply chains. The Dodd–Frank Act Section 1502 is intended to make transparent the financial interests that support armed groups in the DRC area. By requiring companies using conflict minerals in their products to disclose the source of such minerals, the law is aimed at dissuading companies from continuing to engage in trade that supports regional conflicts. In August 2012, the Securities and Exchange Commission (SEC) issued its Conflict Minerals Rule along with guidance for how companies should report on the source of the conflict minerals in question: Tin, Tungsten, Tantalum, and Gold. The Dodd Frank Act Section 1502 is applicable to all Securities and Exchange Commission “issuers” (including foreign issuers) that manufacture or contract to manufacture products where “conflict minerals are necessary to the “functionality or production” of the product. The industries most likely to be affected include electronics and communications, aerospace, automotive, jewelry and industrial products.. An issuer that only services, maintains or repairs a product containing conflict minerals is not affected. An issuer with necessary conflict minerals from Covered Countries that are not from recycled or scrap sources needs to conduct due diligence, and potentially provide a Conflict Minerals Report. 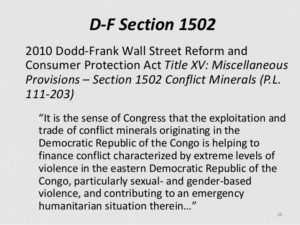 EcoVadis can help companies like yours, to comply with the Dodd Frank Act section 1502 legislation with regards to Conflict Minerals in the supply chain. Contact us to learn more!